Androstenone (5α-androst-16-en-3-one) was the first pheromone identified in mammals. It is produced by the liver from testosterone. It is found in larger quantities in masculine young men with high testosterone levels. Perception of the smell of Androstenone differs in women. Some say it has a slight odor of vanilla; some say it has woodsy type of smell, while others say it is odorless. Androstenone is found naturally in men’s sweat. Androstenone is considered the "bad boy" pheromone. Men wearing Androstenone have reported a strong alpha-male aura. This masculine pheromone helps to convey the message that you are dominant while bordering slightly on aggressive – wrapped up in an air of confidence that can be hard to resist. These masculine traits can appear just intimidating enough to help stimulate the attraction and build the sexual tension you want to create in women. Androstenone is easy to overdose. Too much of this pheromone may cause women to feel overly intimidated or even threatened. Additionally, it may cause conflict with other men. That’s why we suggest a medium or low-dose relative to other types of pheromones. Women are much more sensitive to Androstenone near ovulation. Who can Wear Androstenone Pheromone? Androstenone pheromone is primarily used by men who wish to boost alpha dominance, aggressiveness, and masculinity. However, it may be used in small quantities by women who wish to foster respect from men in career or business situations. 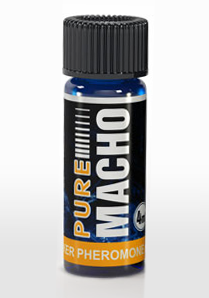 Pure Macho for Men contains relatively large quantities of Androstenone to help create an aggressive alpha male vibe that makes women experience a deep, gut-level attraction. This product helps portray the aura of a young man at his sexual peak, used to getting what he wants, with just the right amount of aggression. Women may to react to a man wearing Pure Macho with butterflies in their stomachs after barely a few words or standing in a close proximity. Women who prefer the ‘bad boy’ and who are open to a hook-up with a highly masculine man may be drawn to you when you’re wearing Pure Macho. Pure Passion for Men contains medium quantities of Androstenone to help create instant sexual attraction. If sexual energy and confidence are the images you want to convey, Pure Passion is the pheromone for you. This product emanates raw, intense sexual passion – intended to cause an attraction at an animalistic level that you may even be able to see in women’s eyes as they devour you in their imaginations. Designed to radiate masculine confidence and sexual experience, Pure Passion can help to create an irresistible attraction that may quickly escalate to physical passion. Pure Success - Unisex contains medium quantities of Androstenone to establish respect from other men in business situations. Pure Success is designed to portray the businessman who has soared above the level of most others to the exotic world of supermodels, penthouses, and a jet set lifestyle. This pheromone may create the air of leadership and success at a level that places you above all others – a force to reckon with in the boardroom or anywhere that you find it enjoyable to do business. This formula is the pheromone of success at an elite level. Pure Icebreaker for Men contains low quantities of Androstenone to emanate playful non-threatening sexual aura. If you want to appear the social butterfly that is always approachable and the life of the party, this is the pheromone for you to try. You may find women giving you their number, or their room key, wanting to discover what’s really behind those playful but mysterious eyes. Pure Icebreaker is the formula intended to help you release your charisma that may attract women who want to get to know the fun and desirable guy who emanates that special ‘something’ they just have to uncover. Pure Temptation for Women contains trace quantities of Androstenone to help create a vibe of a sexually confident woman. Women naturally produce copulins (female pheromones) when ovulating that makes them desirable, irresistible to men – a pure temptation. This pheromone is intended to mimic this sexually-charged time in a woman’s cycle to create an air of enchantment that is unmistakable to men. Make it impossible for him to take his eyes off you at the next event where you’re destined to meet – with Pure Temptation. You may find it drives him wild with passion and set the stage for a night full of seduction and spice. See our full line of pheromones for women.